While crashing the airplane you’re on might be the ultimate buzzkill, there are other, less spectacular, ways the airline can mess up your holiday travel. Canceled flights, lost reservations, oppressive baggage regulations – the list goes on – but here are a few ways to prepare yourself for the fray. 1. E-mails, texts, and automated phone calls are crumbs thrown to you by the airline to make you feel like they’re actually paying attention. Unfortunately, the delay inherent in these methods make them pointless unless everything is running perfectly. Check out FlightStats.com to find out immediately when a problem arises. 2. Know your alternates. Carry a printout of the airline timetable or at least alternate flights to your destination. This can be critical information if you need to rebook or go on standby. Be aware of alternate routes to get where you’re heading also. Your flight might call for you to route through Chicago but maybe another stops over in Dallas. The point here is be prepared to ask the attendant about specific alternatives because, chances are, he won’t take the time to look them up for you. 3. Pull out the contract. The entire terms and conditions of flying are not printed out on your boarding pass but you might consider keeping a digital copy on your laptop within easy reach or even a print out in your pocket. Know your rights when it comes to being bumped, shuffled to a different airline or have your airline miles redemption challenged. If you have the law on your side, and can prove it, expect to get your way more often. 4. Program phone numbers into your cell phone. 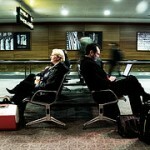 If there’s one consistent aspect of holiday travel, it’s the ever-popular delayed flight. Predictably, passengers facing the prospect if an itinerary change or standby make a bull rush for the service counter to attempt a work around solution. Not you. Call the customer service or head for the self-service kiosk. If the machine can’t help, there’s a phone attached that usually can. The trick to surviving holiday travel with your sanity intact is to anticipate the problem, adapt to the new reality and seek a solution quickly. Unless you sort of like sleeping in those molded plastic chairs and dropping quarters in the slot to watch the original pay television, that is.